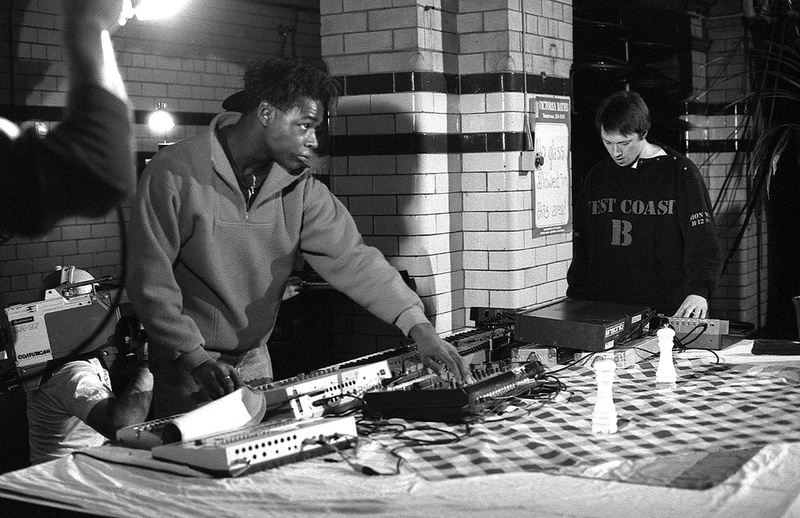 Gerald Simpson playing live with 808 State’s Graham Massey at Manchester’s Victoria Baths, 1988. 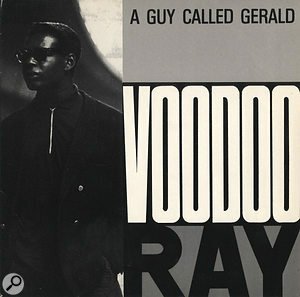 Hailed as the first British acid house single, A Guy Called Gerald’s sublime ‘Voodoo Ray’ has since become a classic in its own right. 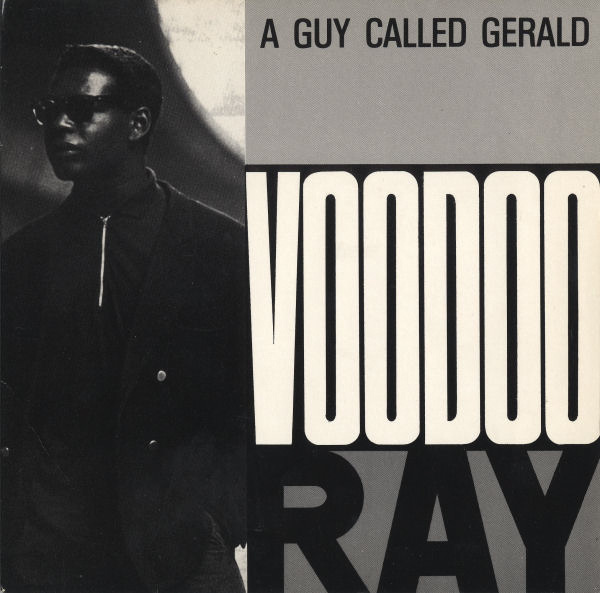 The first acid house single produced in the UK, ‘Voodoo Ray’ by A Guy Called Gerald was an eerie and hypnotic dance record created in Manchester in 1988, at the height of what was known as the Second Summer of Love. Originally released that year on tiny Merseyside label Rham!, it sold out of its initial run of 500 12–inch singles within a day, requiring a very hasty repressing, before spending 18 weeks in the UK charts, peaking at number 12 in 1989. Louder still were the sound-system house parties that Simpson first experienced in Moss Side in the ’70s from around the age of 10. “I grew up in a really diverse place, but it was really safe,” he says. “It was in the middle of a ghetto, but you could leave your door open. Someone would be having a party and you’d be able to hear it and you’d go over. There’d be a sound system playing and you could just kind of hang out. 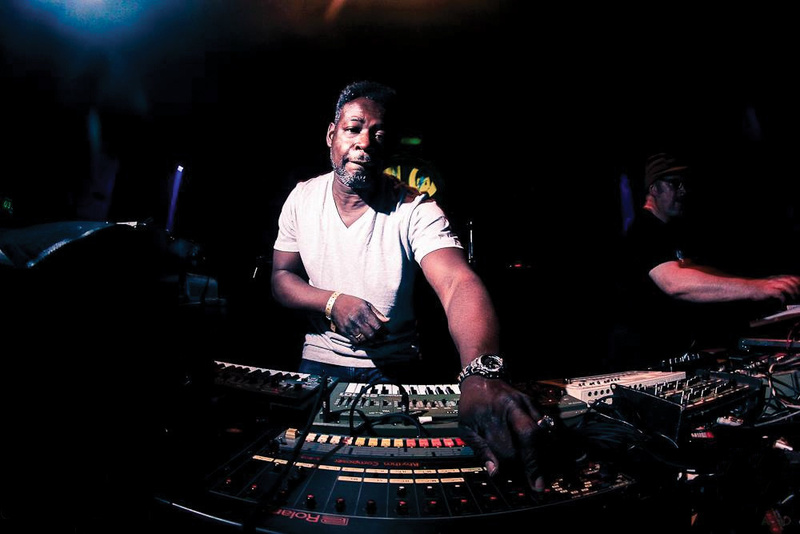 Simpson began working with Eastern Bloc owner Martin Price and a student sound engineer, Graham Massey, on dance tracks together at Spirit Studios in Manchester, originally as the Hit Squad, before they mutated into 808 State. Unusually for the times, where dance producers tended to work individually or in pairs, 808 State were a fully fledged band. Over an intensive weekend in early 1988, 808 State made their first album, Newbuild, which showcased a loose and playful home–grown British take on house music. At the same time, Simpson would take his machines back home to Moss Side to work on his own material, which he felt at the time was too dark and experimental to be presented to the other members of the band. Over these two SH101 parts, Simpson added a sequence from the Roland TB303, the machine originally designed to be a bass line–playing partner to Roland’s TR606 Drumatix beatbox, but whose squelchy tones were co–opted by pioneering acid house producers. “I got the 303 to do a counter riff and I think it kind of covered up the timing,” he laughs. Recently Gerald Simpson has rekindled his love affair with Roland X0X gear, as can be seen in this shot of his 2013 Rebuild collaboration with Graham Massey. Photo: Jan Cavens www.cavensjan.beWorking with this pre–MIDI setup, Simpson used two of the three trigger outputs from the 808 to link to the clock inputs of the SH101s, while the drum machine’s DIN sync out connected to the 303. Around the same time as figuring out how to link and synchronise these machines, Simpson bought an Akai S900 sampler, which offered just under 12 seconds of recording at its full sample rate. Being canny, the young producer found ways to work around this limitation. Running out of sample time on the S900 was to accidentally produce the title of ‘Voodoo Ray’. Lifting a spoken word sample from Peter Cook and Dudley Moore’s Bo Duddley sketch, from their 1976 comedy album Derek & Clive (Live), where Cook says “voodoo rage”, Simpson found that the sample had cut off, reducing it to what sounded like “voodoo ray”. Elsewhere in the track, the cry of “later!” comes from Moore. 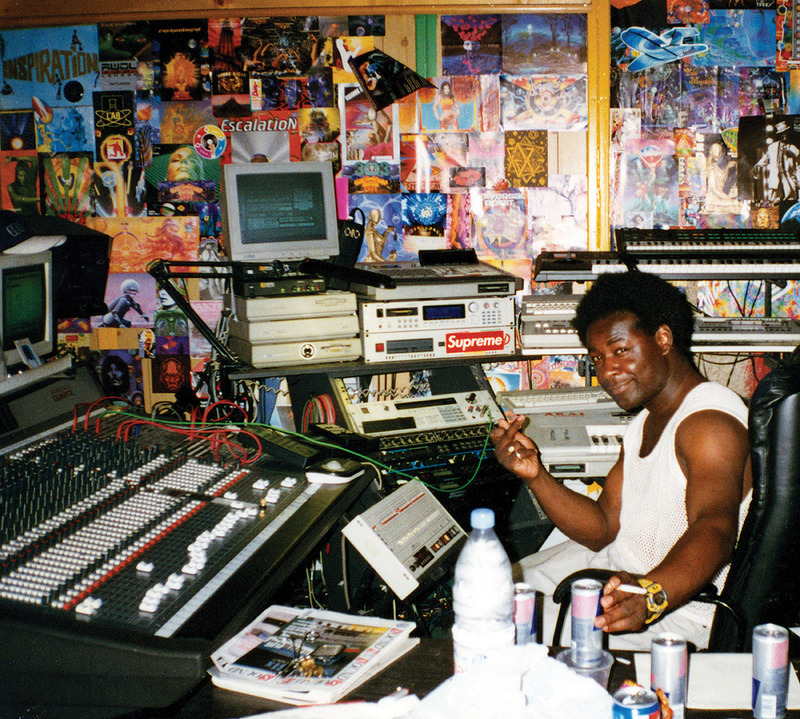 In summer 1988, Simpson took the home–programmed parts for ‘Voodoo Ray’ into Moonraker Studios in Manchester. Using a SMPTE to DIN sync box to connect his 808–driven synth setup to the studio’s Fostex 16–track tape machine, he was able to layer sequences without timing issues. Suddenly, his sonic world opened up. “By then, the sky was the limit,” he remembers. “It was just about that time when people started to discover Cubase. But I didn’t really want to go that way because it was really unstable at the time. I just wanted to create a tapestry on tape, because I’d started to do that with the Tascam four–track. I’d discovered how to record with the Tascam and find my own space for things. So I wanted to do that... I mean 16 tracks was almost too much. It was just crazy. All this space. So as well as being able to trick for time in the sampler, you’d be able to throw it onto tape and go back and still do things.” Given that the 808 offered the luxury of 11 separate outputs, Simpson began to experiment with treating the drum machine’s sounds with different effects. “The 808 was my main sequencer, but if you really wanted to, the drum could be the bass or it could just be a click in the background because you could have a cut-off. For EQ’ing, you could really get into it. With the snare, you could put more snap on it and get this biscuit-tin sound that I was really loving at the time, which worked really nicely with some Lexicon reverbs. You could create almost like this white noise from the reverb. When preparing ‘Voodoo Ray’ for mixing, Simpson and Lee Monteverde spent a lot of time cleaning up the sometimes unwelcome noise from some of the drum sounds. “He was really teaching me at the time how to get clarity in things,” Simpson says. “He was showing me how to properly record. We gated everything and compressed it. Basically we made sure that all the stuff that was on tape, it didn’t have any noise on it. Say there was a bit of hiss on the snare, that would’ve amplified when I started to put reverb on there. I wanted everything to be really clean, and the space around everything to be clean, so when it came to doing the stereo imaging, everything was clean and in its own space. 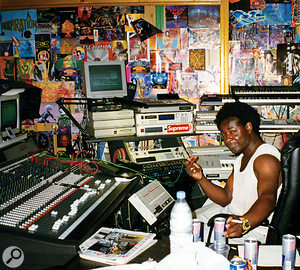 Having launched his career with ‘Voodoo Ray’, Simpson has since produced 11 albums as A Guy Called Gerald. As a result, at the age of 48, he remains in constant demand, performing and DJ’ing all over the world. He stresses, however, that he is firmly against pre–produced DJ’ing. “You get people using Ableton Live with an entire mix already pre–done,” he says. “Then they’re standing there, pretending that the knobs on the mixer are too hot [laughs]. You kind of think, Is it all fake? When it comes to the latter, Simpson is very proud to now be an advisor for Roland, flying to Japan to check out prototype drum machines. For the once tech–obsessed teenager from Moss Side, this represents success far more than any record sales or big gigs ever could.